What's the best way to rouse the empathy of others? To make us understand stories different from our own? I (and many others) would argue that in answering these questions, that old truism a picture is worth a thousand words comes to mind. If you're not convinced, then the Queensland Centre for Photography has a series of exhibitions that will likely sway your opinion. Exhibited here is the work of five photographers who, though from widely different backgrounds, seem unified through their work in the uncovering of stories that wouldn't regularly be seen through the eyes of your typical Brisbane suburbanite. One of the standouts, QCA Lecturer Peter Wanny's series, 'Made it in China', observes the byproducts of China's industrialisation from a remorseful standpoint. It speaks of a nation whose ceaseless strive to house, employ and entertain is citizens has left it in a flux of advertisements, telecommunications towers and destruction which almost co-exists with beautiful oriental culture itself. Another highlight, 'Strangely Familiar' by QCA honours graduate Louis Lim, is the outcome of Lim's year-long collaboration with three physically disabled people. The series seamlessly and beautifully juxtaposes the regularity of Lim's subjects with trace evidence of their disabilities, opening doors into their personal lives to reveal people who aren't as different as mainstream media assumes them to be. Photojournalist Lachlan Gardiner's series 'Fragments of War' is a beautiful documentation of the impact of overseas wars on those back at home, while 'Unsafe Haven' by Abdul Karim Hekmat explores the widespread, Taliban-induced fear of Afghanis during Hekmat's return to his homeland. 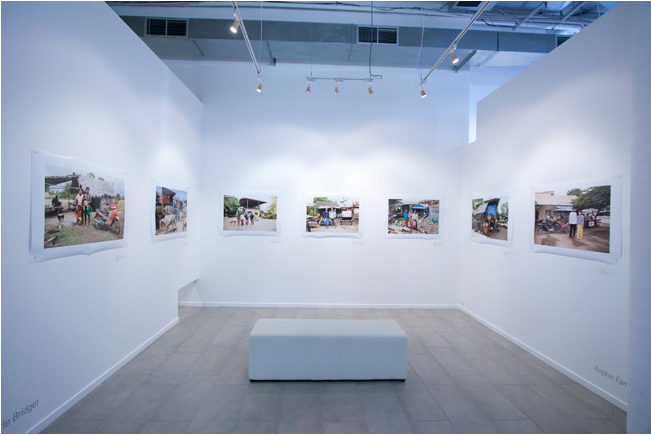 Historian/photographer Elise Hilder's 'Dawn of Time, for the Second Time', speaks jovially of our eternal connection to prehistoric Queensland and its modern manifestations, and 'Angkor Families' by QCA lecturer Earle Bridger is about Cambodian poverty, though the series is bound by a sense of family. All of these series are on exhibition for free at the QCP (diagonally opposite from Musgrave Park), though only until Sunday the 17th of February. So if you're hanging around South Bank or West End over the next week and a half, be sure to drop in for some inspirational and enlightening art.